About a year ago in February 2014 one of my entrepreneurial creations was introduced. 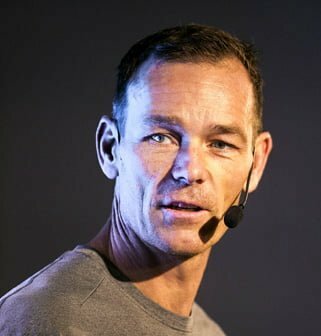 Upon my initiative, me, Fredrik Franzon, and the founding partners of design studio Form Us With Love; Jonas Pettersson, John Löfgren and Petrus Palmér founded a company called BAUX. Our idea was to create sustainable building materials that would be surprisingly functional and remarkably beautiful and meet the demands of contemporary architects, engineers and builders. During the Stockholm Design Week we launched the company with our first product – BAUX Acoustic Tiles. Since then people and brands world wide have greeted us with bells and whistles. More than 150 blogs world wide have posted about BAUX and our products. Google, EF Education, Stella McCartney, Isobar, Barclay Card, Volvo, Telefonica…and the list goes one – have all ordered and implemented our products in their offices around the world. Behind the scenes more brands you’ve heard of are implementing our products as we speak. The reason behind our success? I believe we truly have launched a great product that is not only sustainable and looks great but also has a fantastic product benefit in the way it dampens noise and contributes to restful acoustics in residential buildings, industrial premises and public spaces. It’s now time to take the next step. Today we’re introducing our next product – BAUX Acoustic Panels. Introducing BAUX Acoustic Panels. Made for large spaces or small! 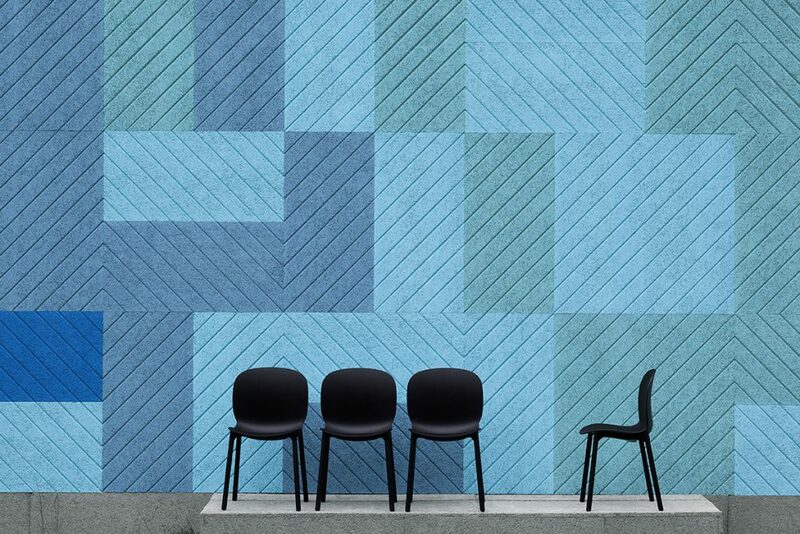 We asked ourselves, how could we create a product that can be used for large or small spaces, without compromising the design and acoustic qualities of BAUX Tiles? BAUX Acoustic Panels, just like BAUX Tiles is an environment-friendly, recyclable material made from wood wool, cement and water. The natural components together provide many functional characteristics. BAUX Acoustic Panels is available in 5 patterns; Quilted, Check, Stripes, Lines and Diagonal, all designed to be combined into infinity. You’re never far from the forest in Sweden. An endless evergreen canopy of spruce sweeps through the countryside. For many Swedes the forest is a place for calm reflection. For us at BAUX, the forest is a source of eco-friendly materials and boundless inspiration. So where better than the forest to showcase our latest creation, BAUX Acoustic Panels? 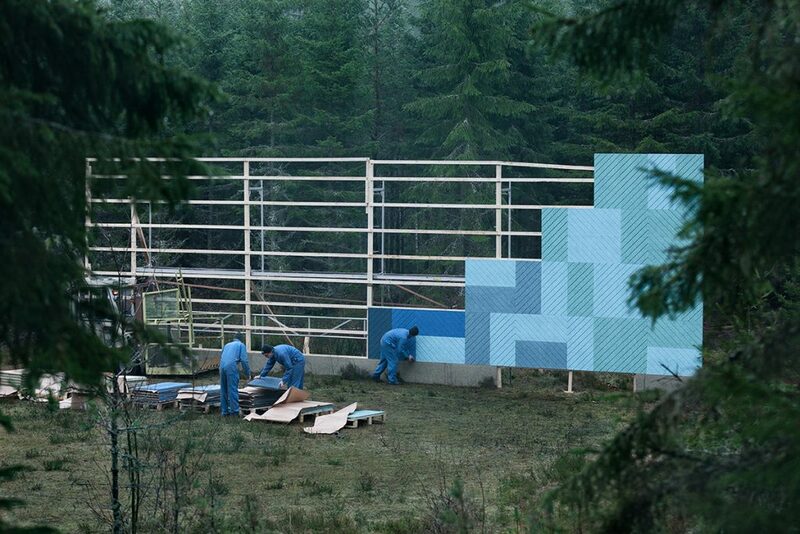 We hatched a plan to create a BAUX installation in the pristine woodlands just outside Österbymo, southern Sweden. 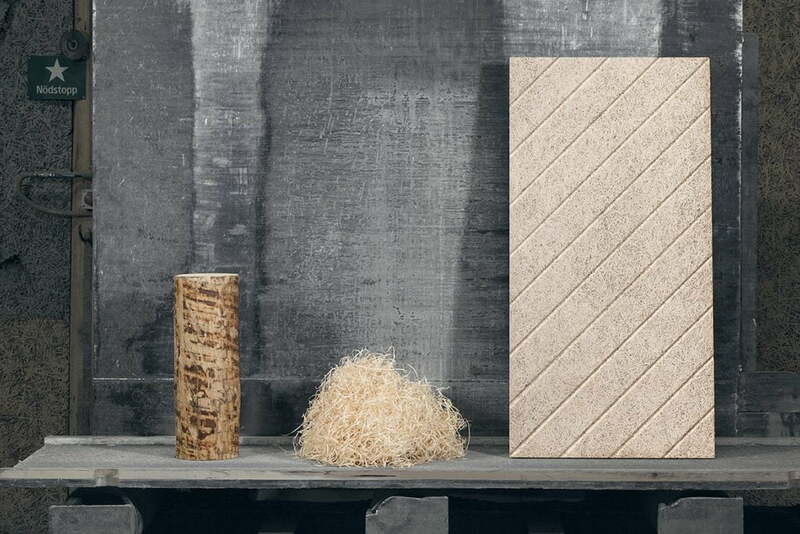 Wood wool from the spruce trees that grow in these forests is bonded with cement in our factory nearby, to create environmentally friendly tiles, with excellent acoustic properties and marvelous natural insulation. In Sweden, the days shorten quickly in the fall, so work started early one October morning while the mist was still clinging to the evergreens. The installation uses Acoustic Panels tiles measuring 116x58cm. 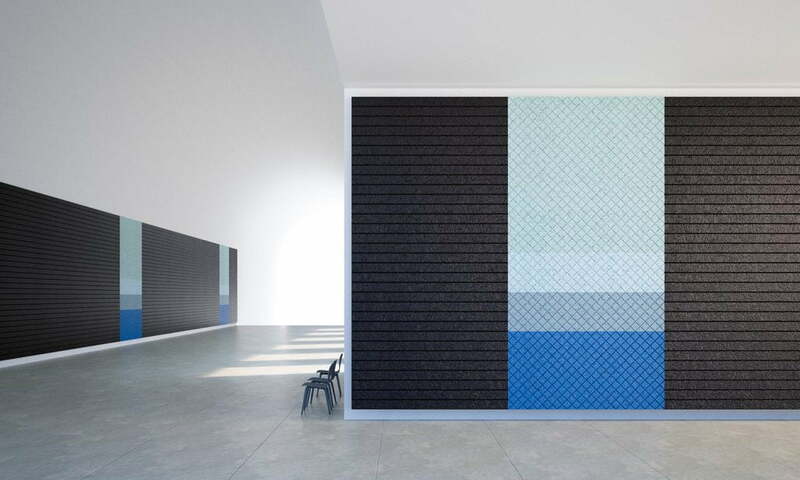 The source of BAUX Acoustic Panels and one of the patterns – Panels Diagonal. There are 5 patterns to choose from and the can be combined into infinity. The design was created using our BAUX design tool, which combines up to five patterns, and a variety of colors, to produce stunning, large scale, geometric implementations. The ease and speed with which these designs can be assembled meant our team of four workers was able to enjoy some Swedish fika (coffee and cakes) and still finish the job before darkness set in. To support the launch of BAUX Acoustic Panels we also created a series of visualisations in order for you to see the potential of our product. 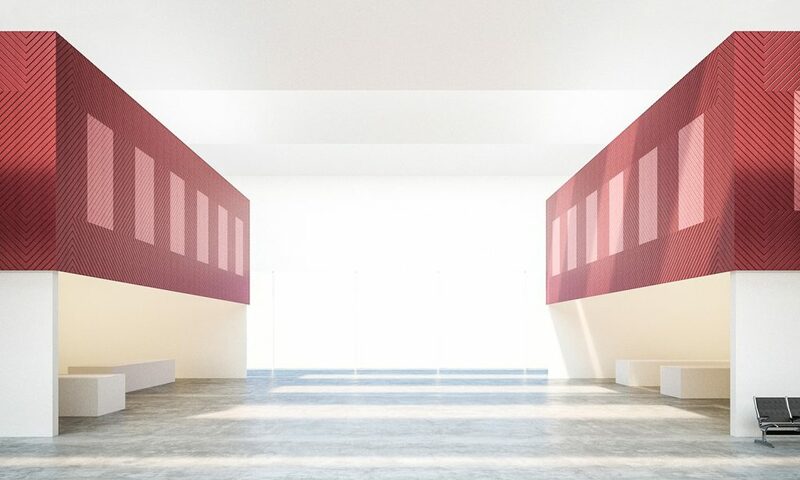 Together with the Swedish architect studio Förstberg Arkitektur och Formgivning we set out to show that BAUX Acoustic Panels can easily be used for larger implementations. By combining colors and patterns you can create stunning wall decorations for your next building or interior decoration project. Here’s a few examples. 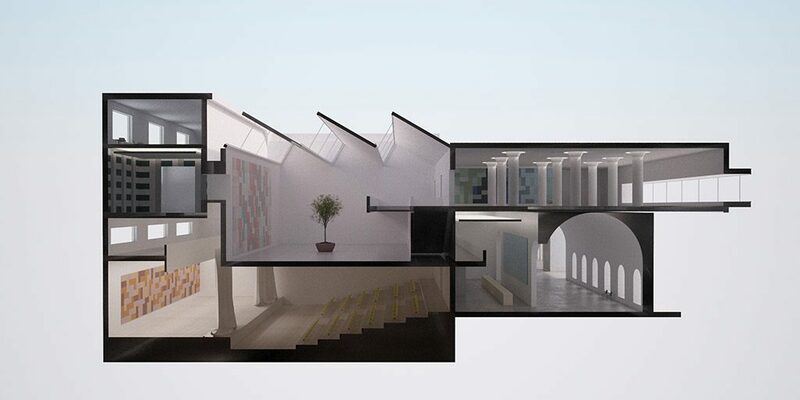 Find the rest of our visualisations on the BAUX website. Next week, one of the worlds most exiting fairs on interior design products will be held in Sweden. Me and the rest of the BAUX team will of course be there. For this occasion we’ve hand built our booth using carpenters from Swedish art school Konstfack. 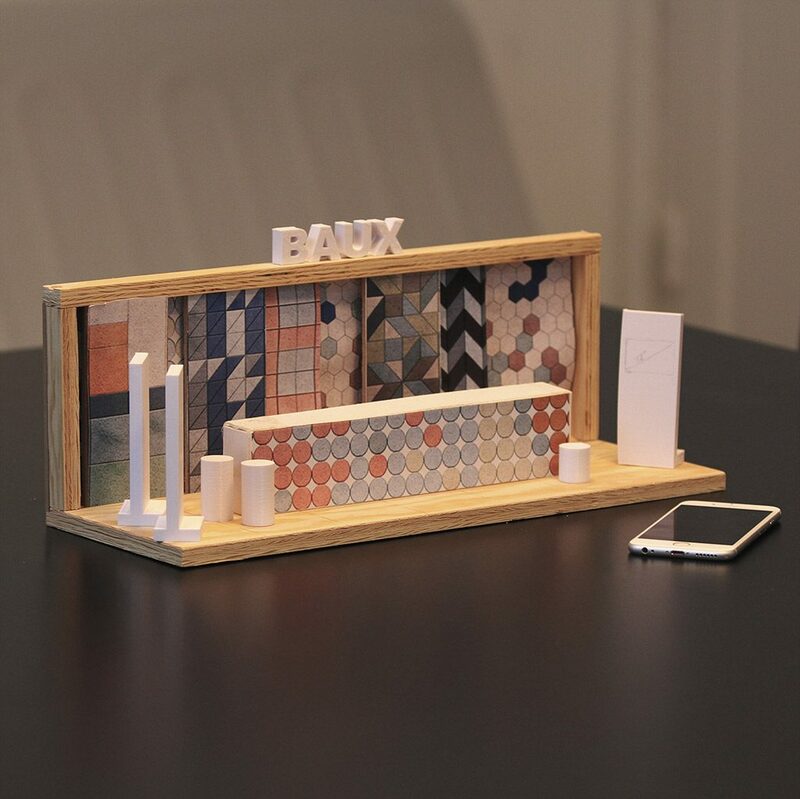 This gives us the ability to showcase the BAUX products for real. Here’s a prototype showcasing what we’re working on. In order to make you experience our product in larger environments I’m also really exited about our virtual showroom – the BAUX Oculus Rift Virtual Experience. Here we’ve taken the product visualisations one step further. Me and Björn from Förstberg Arkitektur och Formgivning have collaborated on a large scale 3D model where the visitors to our booth can step into an ultimate 3D world where they can experience our products. Then I’ve worked together with Dreamstage to bring this model to life inside Oculus Rift. So, what are you waiting for. Head over to the BAUX website and learn more or come visit us at the Stockholm Light and Furniture Fair during the 3-7 February. Visit us at the fair, booth A04:14.